The winegrowing region known as the Clare Valley is situated 137 km due north of Adelaide. It was named by Irish settlers for its great beauty and its resemblance to the lovely green County Clare in Ireland. The valley incorporates four main river systems and stretches for 30 to 35 kilometres in width. There are five sub-regions within the valley, proceeding south from the northern end, Clare, Sevenhill, Watervale, Polish Hill River and Auburn. In 1969, Bill Taylor Snr., along with his sons John and Bill, purchased a holding of 178 hectares by the Wakefield River in Auburn and planted Cabernet Sauvignon. The site was carefully chosen for the red brown loam over limestone soils (called terra rossa) and the cool climate of the Clare Valley, known to be excellent for Cabernet Sauvignon. That year they planted their very first Cabernet vines, and never looked back. Wine lovers today know they can trust Taylors to deliver superb quality table wines year after year- the family spare no expense or effort to ensure just that. Indeed, Taylors took little time in proving that the dream wasn’t just pie in the sky – in 1973 they tentatively entered their inaugural vintage of Taylors Cabernet Sauvignon into the respected Royal Adelaide Wine Show – and were delighted to win the prestigious Montgomery Trophy for best red wine in the show! The family always knew there was something in the soil. During the initial excavation of the vineyard dam, Bill and his sons were amazed to uncover the fossilised remains of tiny seahorses - confirmation that the area had in fact once been the bed of an ancient inland sea. The Taylors thought this to be a lucky omen and testimony that the terra rossa soils were indeed fertile, and with thoughts firmly fixed on the successful future of Taylors Wines, the family adopted the three seahorses as the company insignia. Today those seahorses are found on Taylors wine labels all over the world. The Taylor family vineyard and winery is one of the first that visitors encounter as they enter the valley from Adelaide. Each sub-region has its own geographic and climate characteristics. Some of the vineyards are quite elevated - the Taylor family vineyard is located 350 metres above sea level, and although the general climate could be described as Mediterranean, each small area is subject to its own micro-climate. Many wines from the Clare Valley exhibit distinct cool climate characteristics and intense varietal fruit flavours. The site enjoys warm to hot days and cool evenings during the ripening period. Vintage usually takes place around March each year. The vines are grown in rich terra-rossa (brown loam over limestone) soils. Winemakers have been attracted to the Clare Valley since as early as 1840. Today the soils and microclimates surrounding the Taylor Vineyards are considered the most exciting area for winegrowing. 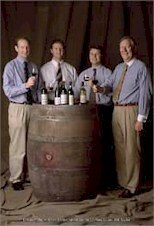 Producing the quality wines that Taylors are renowned for year after year is definitely a team effort. The high level of commitment to that quality starts at ground level from the vine and flows all the way through to the end result, Taylors Wines.